Wicked Quotes are pleased to announce the launch of the brand new design of their website. Containing loads more helpful information for motorbike riders looking for insurance and with a comprehensive list of Frequently Asked Questions about everything you need to know when insuring your motorbike. and a Wicked Quotes blog – which is this section you are reading now! 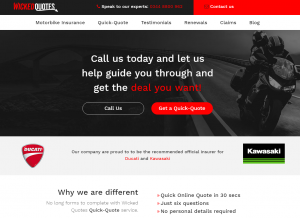 We hope this new, massively improved Wicked Quotes website helps our current customers with the information they need and guides new customers to becoming aware of our knowledge and experience in the Motorbike Insurance industry. I received excellent customer service from Wicked Quotes motorcycle insurance. I also received a competitive quotes, efficient delivery of paperwork, and I spoke to a real human who was interested.